FarmVille Crop Mastery Upgrades Coming! FarmVille Crop Mastery will be upgraded in the future (no release date yet) to include a new feature. 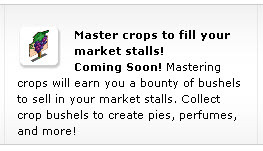 Obtaining Crop Mastery for any specific crop will earn you "bounty of bushels" that you will then be able to "sell in your market stalls". You will be able to collect crop bushels to create "pies, perfumes, and more". Interesting! This could be a part of the unreleased Farmer's Market future upgrade that was mentioned in the Games.com exclusive interview with Zynga. What do you think?